Newark mayor Ras Baraka tries to wrest control of the city’s schools from Cory Booker, Chris Christie, and Mark Zuckerberg. Who Gets to Control Newark’s Schools? A rabble-rousing new mayor wants to undo the reforms that Cory Booker, Chris Christie, and Mark Zuckerberg brought to town. Newark’s new mayor, Ras Baraka, at an election party on May 13, 2014. 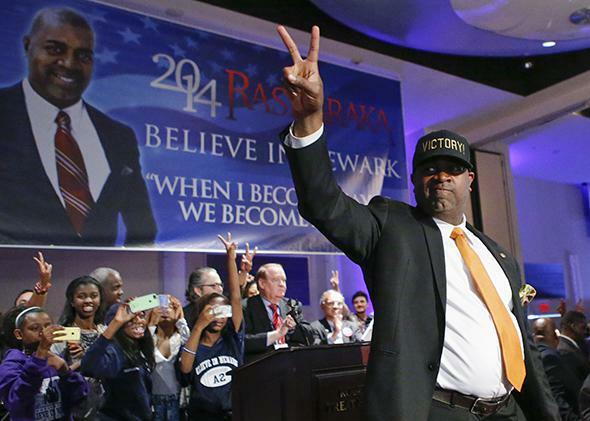 In Newark last week, high school principal and city councilman Ras Baraka was elected mayor. Tuesday Baraka unveiled his agenda for educational “local control”: a return of the Newark school district to city management, and a total rejection of the school reform policies embraced by his predecessor Cory Booker, Gov. Chris Christie, and their philanthropic patron Mark Zuckerberg, whose $100 million donation has reshaped the city’s educational landscape in the direction of new charter schools and teacher evaluation and pay based on student standardized test scores. Those closely watched reforms, funded by corporate donors and supported by centrist politicians with national ambitions, are “taking away our right to democratically govern our public schools,” Baraka has said. Instead of shutting down failing schools and turning their buildings over to national charter chains, he argues that Newark should send even more money to struggling neighborhood principals for a longer school day, afterschool programs, bonuses to reward teachers who work in the most challenging schools, and the hiring of more guidance counselors and social workers. On Tuesday evening, student protesters staged a sit-in at a school advisory board meeting, bringing it to a disruptive close. The students demanded that superintendent Cami Anderson, a Booker/Christie/Zuckerberg ally, resign. The protesters were no doubt inspired by their new mayor—talk of taking back the city’s schools is the rhetoric that won Baraka the election. With Baraka’s win, Bill de Blasio’s November victory in New York, and former Washington, D.C. mayor Adrian Fenty’s stinging loss in 2010, due in large part to school chancellor Michelle Rhee’s unpopularity, the local control movement is having a moment. It’s not exactly new: Ras Baraka’s father, Amiri Baraka, led a fiery charge for community control of Newark’s schools in the late 1960s and early 1970s. But while Amiri Baraka was a virulent critic of union teachers, his son’s biggest ally has been organized labor, including the Newark Teachers’ Union. So, what’s changed? Why did one Baraka enrage the unions in 1970 by supporting local control of schools, while, 44 years later, another Baraka earned Big Labor’s endorsement—and hundreds of thousands of dollars of their funding—with a local control agenda? Amiri Baraka died in January. Today he is most often remembered as the controversial former New Jersey poet laureate, who claimed in verse that Israel had prior knowledge of the 9/11 attacks. But before all that, he was a beatnik, a black nationalist—and an education reformer. Born Everett Leroy Jones, Amiri Baraka grew up in Newark and attended the racially integrated Barringer High School, where he worked on the school newspaper and eventually earned a scholarship to Howard University. He later joined the Air Force and landed in Greenwich Village, where he began his career as a political agitator, poet, and playwright. Baraka served on an advisory school board tasked with directing money from Title I, the federal education program, to Newark’s poorest public school students. But he and his second wife, Amina Baraka, withdrew their own kids from the public system, enrolling them in a private school with a Black Nationalist curriculum. As activists, the Barakas hoped to enact a similar Afrocentric curriculum in the public schools. These tensions exploded on Nov. 17, 1970, when a black third grader, Matilda Gouacide, was struck by a car as she left Newark’s South Eighth Street School. The accident released all the pent up frustration in the black community—if not for the new teachers’ contract, an adult might have been on hand to supervise Matilda’s walk home. Black parents, led by Baraka and other activists, demanded that the city renege on the teachers’ contract. When Newark’s new black mayor, Ken Gibson, attempted to do so, the 2,500-member Newark Teachers’ Union went on strike for 14 weeks, the longest teacher strike in American history. Both union teachers and anti-union activists armed themselves; there were shootings, knife fights, beatings, and vandalism. One teacher died and 185 more were sent to jail. In the end, the teachers’ union retained a fairly tight hold over education policy in Newark, even after the state took over the failing district in 1995. Now, more than 40 years after Amiri Baraka lost the battle for Newark’s schools, his son is trying again. Ras Baraka is passionate about putting Newark natives back in control of Newark’s schools, where 95 percent of the nearly 40,000 students are black or Latino. * But times have changed. In the 1960s and 1970s, community control meant black activists, parents, and politicians wresting power from a strong, white-dominated teachers’ union. In 2014, community control means black politicians allying with the much-weakened union to oppose a set of policies—charter schools, teacher merit pay, and school closings—that often seem (or are) imposed by wealthy, often white outsiders. In her excellent recent New Yorker feature on school reform in Newark, Dale Russakoff reported the shocking fact that the going rate for educational consultants in the city is $1,000 per day, even as schools go without basic repairs and supplies. In a followup New Yorker podcast, Russakoff explained that the teams of imported consultants that descended on the city after the Zuckerberg donation “really haven’t spent much time at all in public schools in the communities. They’re really about management reforms, from the top down, that they believe will make a huge difference in the delivery of education to children. But it does leave out the most important story in education, which is what’s going on with the kids and the families in the neighborhoods.” Indeed, when I reported from Newark in 2011, I heard parents say that teen pregnancy—not low test scores—was the city’s biggest educational challenge. Today’s national school reformers are learning a lesson teacher unionists learned, painfully, back in the late 1960s and early 1970s: They can’t assume they know what parents or local neighborhoods want from their kids’ schools. If they do, they run the risk of offending the communities they are trying to help. Those communities might turn toward politicians who seem to pay them greater heed. If Mayor Baraka succeeds in wresting control of Newark’s schools from Gov. Christie, he’ll have to do something his father never did: prove that community control of education can actually help an entire city’s children learn. If he doesn’t, community control will return to the historical dustbin as yet another failed idea to transform urban education.